You’ve picked the perfect venue, with every element working together (flowers, place settings, linens, cake, presentations). But the focal point of your event is the stage. Do you really want your audience looking up and seeing a hodge-podge of black amplifier cabinets, black wires sprawled everywhere, chrome and black mic stands, creating a stark contrast with your beautiful, color-coordinated event? Serenade of Souls offers a unique solution for this problem – our clients can choose our CUSTOM, one-of-a-kind stage display that hides all the black and chrome equipment and wires for a clean, seamless look. 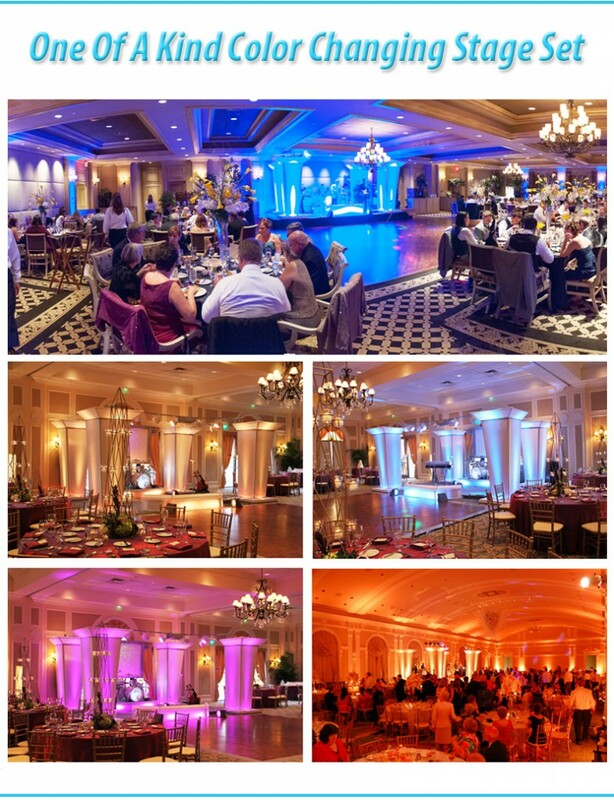 Also, our specialty color changing system can be set to precisely match the colors in your room design An additional upgrade is our beautiful room up-lighting, which is linked with our custom stage lighting, creating an amazing ambient atmosphere for your entire room!